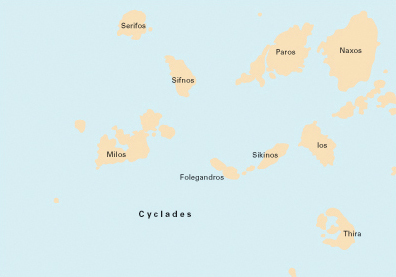 The Cyclades - Κυκλάδες lay in a circle (Greek: kyklos) around the sacred island of Delos, the birthplace of Apollo, and consists of 23 large islands and some 200 smaller ones. 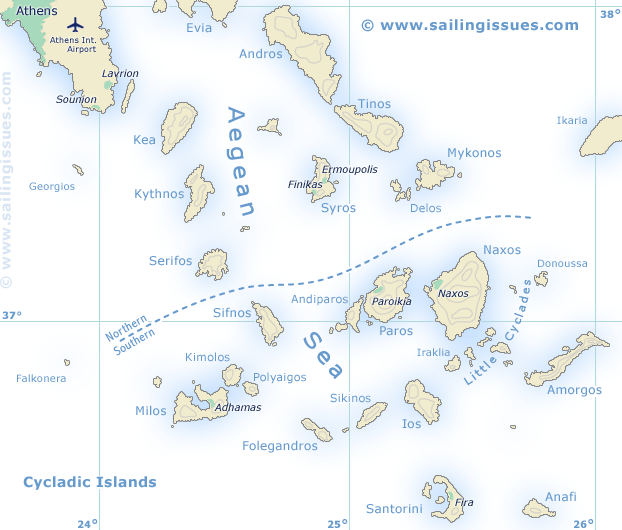 The archipelago is based on a submarine plateau which extends in an arc from the most easterly point of Attica and Evia towards the coast of Asia Minor. All the islands are hilly. The northern ones consist predominantly of Cretaceous limestone, micaceous schists, gneisses and marbles; those to the south consist in part of volcanic materials. 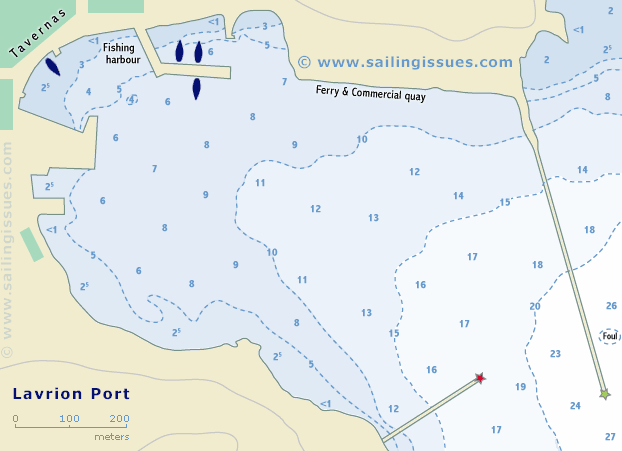 Charts & descriptions should not be used for navigational purposes. 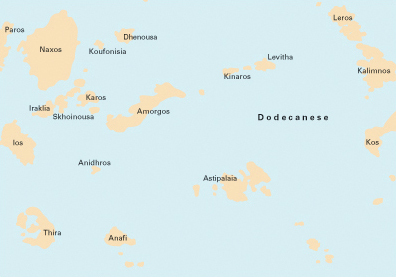 Evidence of settlement dating back to Mycenaean times has been found on the islands, but their first emergence into the light of history was in 743 BCE. 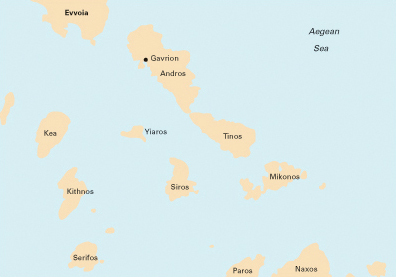 In the 5th century BCE the islands came under Athenian influence, and in the 2nd century BCE the Roman Empire took over. Later they became under Byzantine rule, and in 1085 were conquered by the Normans; subsequently in 1203-04 the Fourth Crusade brought another change of masters. The Cyclades now fell into the hands of Italian rulers, and came under Venetian control. 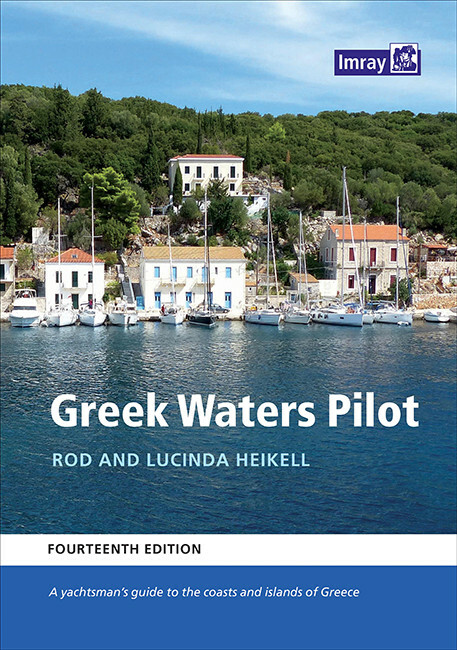 Guide to yacht charters: 8 steps towards a succesful sailing holiday in Greece or Turkey. The port of Lavrion (Laurion or Lavriou) is located at the south east of Attica, and is in many aspects a more convenient yacht charter base to explore the Cyclades from than the Alimos marina - Kalamaki marina in Athens. The distances from the International Athens Airport are roughly the same, yet you will spare yourself a sailing day along the dull concrete outskirts of Athens and for instance the port of Kea is just 14 nm away. Therefore, this less known port of Lavrion is sometimes called the gate of the Cyclades and already quite a few charter companies have set up a base here. Other bases to start your sailing holiday are Paroikia port in Paros, Syros and Athens, which makes it possible to sail a one way charter from for instance Athens or Lavrion to Paros. For unbiased advice on charter companies please go to my page on Yacht charters.